Nothing But Me~: An's Besday! It's 2.23 am, juz finished my shower. me with my cazens went to celebrate An's besday(he's my cazen too) ..
we went to da beach! 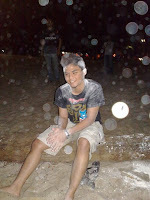 yup.. tepung was involved ..
i wanted eggs too but since i'm in Terengganu, i dn't noe how to get 'em. til thn, nk g tgk some horror movies nih! *This is the besday boy!